1 Marinate chicken with the ingredients called for ‘marination’ for 10 mts. While the chicken is marinating, work on the rest of the preparation. 2 Heat oil+ghee in a vessel, add all the garam masala ingredients – bay leaves, cloves, cinnamon, cardamom, mace, star anise, marathi mogga and nutmeg. Saute for few seconds. 3 Add sliced onions and green chillis and saute for 6 mts till onions turn transparent. Add ginger garlic paste and saute further for 2-3 mts. Add chopped tomato, mint and coriander leaves and saute for 4 mts. 4 Add the chicken along with marinade and combine well. Cook on high for 2 mts, reduce flame, place lid and cook for 15-16 mts or till the chicken is three fourth cooked with little gravy left. It should not be completely dry but appear like a gravy dish. 5 Add water and coconut milk and bring to a boil. Adjust salt, reduce flame and add the strained basmati rice. Add 4-5 mint leaves and 1/2 tbsp coriander leaves and place lid and cook on low flame till the rice and chicken are cooked. This could take approx 15-18 mts. Turn off heat and do not remove lid for 10 mts. 6 Remove lid, add 1/2 tbsp ghee and combine gently and serve hot with raita and curry of your choice. 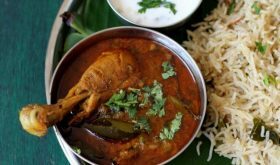 Pulav with chicken sounds yummy! The Chicken Pulao looks very fluffy and appetizing. When I cook it will not turn out to be the same. I have to do some research to see what is the main reason. I can not give up to make this one so perfect in consistency. It looks just right. The rice is very much separated and not broken. That’s how I would like to see my “Chicken Pulao” after I finish cooking. With best wishes and regards. Chicken pulao looks perfect and yummy. I dont know if I have asked wrong question. 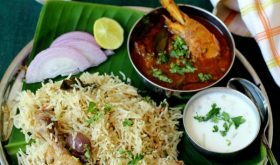 What’s the difference between the chicken pulao and biryani? You have not asked a wrong question. 🙂 When marinated meat and rice are par cooked separately before being layered and cooked in â€˜dumâ€™ over low heat its called biryani. 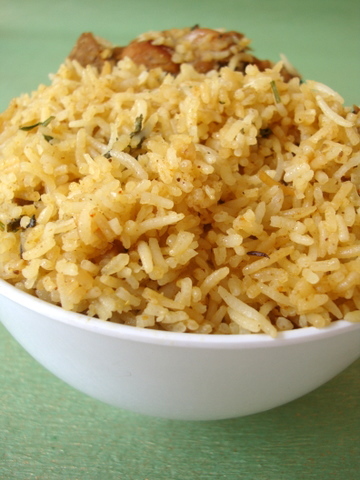 When meat is cooked along with the rice using â€˜absorptionâ€™ method, its pulao. Usually for pulao, the meat is not marinated but cooked directly with spices. Hope this helps. I’m a college student with my first (very tiny) kitchen, so I tend to buy premade garam masala to save time and space. 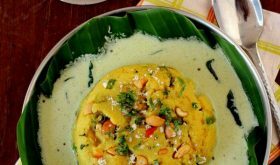 How much masala powder should I substitute for this recipe? You can use a little less than 1/2 tsp of store bought garam masala powder. should v grind coriander leaves and nmint leaves for the marination?can v powder the garam masala ? does it make a difference if v put it whole r grind it ? No need to grind mint and coriander leaves for marination. No, do not powder the garam masala, add them whole. Tried your recipe. Chicken Pulao was great. Thanks! I tried your recipe for the last weekend. My hubby loved it. It became little mushy because i lost the water and coconut milk count. But it tasted yummy. Will def try it again. could you tell me if this can be prepared in electric rice cooker….i mean from step 5….please suggest. Yes, you can use an electric cooker. i tried ur recipe yeserday ….super….thank u very much…. I tried your recipe exactly as it was last week and it turns out well. Everyone loves it. Thanks for the posting. I used rice cooker and the problem is,it got burnt at the bottom of the cooker. How to prevent this from happening again. I tried it , its awesome…I made titlle change like grinded green chiles, mint leaves and coriander leaves and marinated. Great Recipe. Could you please post the recipe for Shrimp Biryani. Thank you. Dear Sailu, Is there any way i can prepare coconut milk at home? The stores are too far and i cannot go during these days.it would be great help if you could help me out with this?and i would like to know what is marathi mogga and mace? Waiting for your reply asap. Thank You . Yes, you can make coconut milk at home. Blend the grated or cut fresh coconut pieces with water. For a cup of coconut pieces add 1 1/2 cups of water. Strain the coconut milk and throw out the pulp. Marathi mogga is dried caper fruits and mace is the dried outer covering of the nutmeg fruit. You can omit them if you do not find them at your local stores. very delicious recipe!!!!!!!!!!!!!! i tried it and got compliments too thanks…..
hai sailu garu ur recipes are nice. can u plz post home made ice creams, it will help me for my school going kids. very tasty recipe…i loved cooking as well as eating too.thanks for posting. Amazing flavor. In the last fortnight I have attempted both your hyderabadi biryani and this pulao. The latter was very flavorful. I have filed printouts of your recipes for future references and this one definitely gets 5 stars along with my other favorites. Thank you for your earnest attempt Sailu. Your passion for cooking comes through your simple presentation and pleasant site. I loved this recipe and my very picky menfolk loved it too! I have been given the green light to make it again! I had to back off a bit on the green chilis but it was still plenty hot and tasty! I have been cooking Indian food for 27 years and love coming across new recipes! Thank you so much! I’ve made this dish 3 + times and have gotten raves. This time I ventured to add potatoes and carrots and it was a great addition. I cut the carrots into about 5 pieces per and they were the perfect consistency. The flavors all complimented each other well. A wonderful “one-pot” meal! 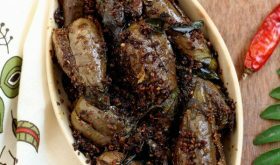 Don’t remember the number of times I cooked this….followed it exactly except increasing the green chillies and my family always loved it. I shared this recipe with my cousins and they all loved it. Thanks for a great easy recipe. This never failed me. Can add vegetable instead of chicken? Yes, you can. Use 1/4 cup milk. What is the quantity of the cup that the recipe uses? Is it 240ml? hi sailu! 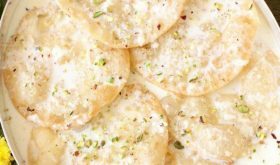 complete novice of a cook here and i wanted to ask – when you say “cups” in the list of ingredients, do you mean the standard cups used in baking/western food or the smaller tea cups we use in india? thanks! This is a delicious dish! Yesterday I found myself wanting something comforting and yummy. When I was bringing the spices together I really was not sure it would be as good as I hoped, as the combination is not a familiar one to me. And I was right: it was even better! The rice was fragrant and fluffy, the chicken tender and tasty. Made cucumber carrot raita to go with and it was a great success. This is a “keeper”. Thank you. If i have whole chicken, How much rice should i add? For 1 kg chicken, use 1 kg rice. Can you please tell me whether it’s ok if I don’t use Marathi mogga?? Yes, its fine if you omit it. Thank you for responding I needed this as am all prepared with all ingredients for a dinner party tonight!! Thanks again!! If I have to prepare the dish for 1 kg chicken, Do I need to double all of the ingredients? Tried ur chicken pulao few days.. Came out great.. The flavourful rice n tender chicken really was a hit in the family. Thank u so much fr ur recipes. is mint leaves compulsory?? because my husband does’nt like the flavour of mint leaves?? No. You can omit it and use coriander leaves.